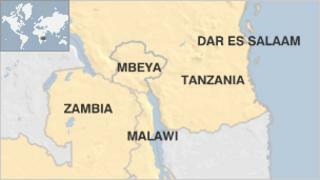 A British man suspected of terror offences has been arrested in Tanzania, police in the east African country say. Tanzanian officials said Assan Ali Iqbal was being held in connection with bombings in the north of the country. He is also suspected of involvement in terrorism in the UK, they said. He was held after he was found to be carrying a forged Tanzanian passport. The Foreign Office confirmed the arrest and said it was offering consular assistance. Police said Mr Iqbal was arrested in the Mbeya region for possession of both a British and Tanzanian passport as he tried to cross the border with Malawi. Director of criminal investigations Robert Manumba said they had established that the Tanzanian passport Mr Iqbal was carrying was a fake. He said Mr Iqbal was also found to be carrying a laptop containing "seditious material" designed to cause "religious incitement". Mr Manumba said in a statement on Friday: "At the border he presented a Tanzanian passport, but when the immigration officers spoke to him in Swahili he was unable to communicate. "That raised suspicions that led to him being detained for further questioning and in the course of that he was found with the UK passport." He continued: "We have been in contact with our counterparts in the UK and they have confirmed that the suspect is wanted in their country for involvement in terrorism activities." Mr Manumba did not give further details of what crimes Mr Iqbal is reported to be suspected of in Britain. He said a Tanzanian man travelling with Mr Iqbal was also arrested and questioned. In the UK, a Met Police spokesman declined to comment on the arrest. Several people have been arrested on terror charges in Tanzania since bombings in May and June killed at least eight people. Authorities in Tanzania are concerned at the growth of an Islamist movement accused of links to Somalia's al-Shabab. Mr Manumba said police were investigating whether there was a link between the arrests and the recent bomb attacks. He said: "Our officers are working on it and we are hopeful that we shall get answers soon."